Howard Butterworth captured a scene at the Dee last month and will donate £25 for every print that is sold. 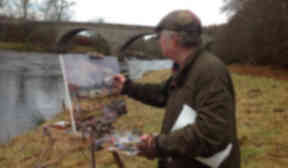 As Howard Butterworth perched up at the Potarch Bridge at Ballogie, paint palette in hand, he hoped to capture a memory of the famous river on canvas that captured a sense of that feeling which future generations may not experience. Having moved to Aberdeenshire in the 1960s, at the age of 30, the River Dee became his second home as he fished with friends and family. "Many years ago, I popped down on a day ticket – just in my jeans. There was a Japanese film crew there, they had been on the river all week trying to catch something," said Howard. "In half an hour, I pulled out a 12lb salmon and they caught it all on camera. I looked more like a poacher than a fisherman. "There are times that you can go down and see the silver flick of salmon darting through the water all around you; it is a very special place." Howard was inspired to paint after moving to Scotland from Yorkshire. His paintings have been sold all over the world and the Queen Mother has supported him throughout the years, placing his work in her personal collection. At his studio in Butterworth Gallery, in Aboyne, he produces mostly oil paintings and his style captures the atmosphere of light and colour that is so unique to Scotland. Howard said: "Aberdeenshire is such a magnificent place and it is the natural beauty that is the most breathtaking thing about it. "As an artist, it is a great place to come to be inspired. I have painted around the Dee many times over the last 30 years and have been treated to a different spectacle on each occasion." 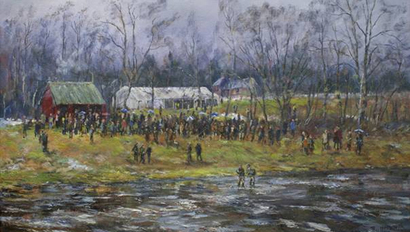 To celebrate the 150th anniversary of the Dee District Salmon Fishery Board, Howard produced a commemorative painting that he presented at the River Dee opening ceremony last month. However, changing climates and surrounding infrastructure have affected the species of plants and wildlife around the river, which are increasingly under threat. Howard added: "Salmon stocks were decimated in the 1960s after a disease spread through the wildlife up here. "Before then, there were so many fish that people would actually pay for their fishing with the salmon that they caught; people could make a lot of money at it. "Now, it is quite expensive and people fish because they want to come down here and enjoy everything that the Dee has to offer." The River Dee Trust has now launched a £2.5million Pearls in Peril project, which will see native woods being planted throughout the upper catchment and tributaries. Shading helps to cool the river during summer, which stabilises the banks against erosion and provides a home for invertebrates which are vitally important to the rare freshwater pearl population and juvenile spring salmon. Contributing to ongoing efforts to protect the majestic serenity at the river, Howard has produced 100 numbered high quality Giclée images of his painting of the Dee, and will donate £25 to the project for every print that is sold. Howard added: "Everything inevitably changes but it is horrible to think that generations to come will miss out on fishing, watching the wildlife or even just taking in the beauty of the surrounding plants and trees. "This is an important project that works towards conserving all that we love about the River Dee so that we can continue to enjoy the area." Ken Reid, Dee Fisheries development officer said: "It is a fabulous gesture for Howard to donate these prints for our project. "This represents an absolutely unique opportunity to get a once-in-a-lifetime memento celebrating 150 years of stewardship of the board. "The river has had its glory days and it has gone into decline. There has been a great deal of effort put into restoring it and now, to have this support from such a talented artist, is just wonderful." To find out more about Howard's work, or to buy one of the River Dee prints, visit The Butterworth Gallery online.